Your sleep can make or break your health! 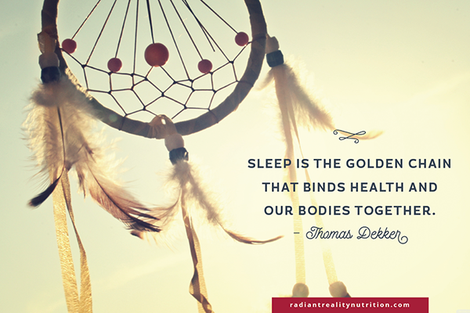 9 ways to Elevate your Sleep - Radiant Reality | Nutrition. Healing Arts. Inspired Living. When you sleep your body goes into repair mode and in a deep sleep, your kidneys clean your blood, your organs detoxify, cells are replaced, wounds heal and muscle tissue repairs itself. Too little sleep weakens the immune system, affecting growth and stress hormones, cardiovascular health, obesity, diabetes, stroke, high blood pressure and mental distress. The immediate results show up as exhaustion, fatigue and depression. This is why staying up all night makes you feel like you were hit by a mac truck. You may get away with it in your 20‘s, but as you age, your body becomes much less forgiving. Sleeping problems can be a result of many different types of stress, hormone issues, adrenal stressors, blood sugar imbalances, neurotransmitter issues or other inflammatory conditions. I love the visual that likens the hormones in our body to a symphony with the circadian rhythm as the orchestra conductor. Our circadian rhythm regulates sleeping, hormone production, regulation of glucose and insulin as well as many other biological activities. Hormones specifically affected by the circadian rhythm where sleep is concerned are melatonin and cortisol. Your master circadian clock is responsible for the rhythm the pineal gland which secretes a hormone critical for sleep called melatonin. Melatonin has many functions but when related to sleep, it suppresses the activity of other neurotransmitters and helps to calm the brain and light is the “great regulator” of melatonin. 1. Get to bed before 11pm. Treat your bedtime like you would an appointment and make a habit of getting to bed before 11pm. The “wired” sensation that kicks in after 11 happens due to a cortisol surge in the body that will keep you awake. Instead, get to bed no later than 10pm with a book (no electronics) and allow your body to decompress before sleep. 2. Use blue light blocking units on your devices. When using electronic devices at night, the blue lights are associated with sleep disturbances and suppresses the production of melatonin. Solution: Install blue light blocking devices on your devices such as Zen Tech and f.lux. These devices mimic the change in light outside and help your body prepare for sleep. 3. Sleep in a pitch black room. Use blackout curtains. Put electrical tape over LED lights. Some people advocate cutting all power to the bedroom during sleep to enhance the process. 4. Keep your bedroom air cool. Heat and lack of airflow in bedrooms make for poor sleep. 5. Cut out caffeine after 2pm. There has been a lot of research on caffeine disruption and sleep by researchers at Michigan’s Henry Ford hospital’s sleep disorders and research center and Wayne State college of Medicine. The research found that caffeine consumed even 6 hours before bedtime resulted in significantly diminished sleep quality and sleep quantity. 6. Use infrared light 20 min before bed. This is a surprisingly cheap and easy bio hack that helps increase the production of melatonin which is a necessary hormone for sleep. I like the RubyLux Near Infrared bulb but there are many out there. I have found that reading before bed with a infrared light helps my body relax into sleep much easier. 7. Support blood sugar levels before bed. Blood sugar fluctuations can wake you at night and keep you from achieving a deeply restful state of sleep. This is because a rise and fall in blood sugar triggers a stress response which stimulates cortisol and adrenaline which most likely will wake you up. Also if you stabilize your blood sugar levels throughout the day, it will influence your blood sugar at night. Avoid carbs or sugars before you sleep, instead eat a bit of protein and healthy fat if you need fuel but try not to eat right before bed. Nutrient tip: The nutrient chromium is a helpful blood sugar hack. This micronutrient provides necessary support for blood sugar that can help your body maintain more stabilized blood sugar levels and help you maintain better sleep as a result. 8. Support cortisol levels with adaptogens. Cortisol is the bodies stress and aging hormone. Without going into too much detail, cortisol effects our entire biology. From our endocrine system (which produces all our hormones), it also affects our digestion, immune and neurotransmitters. Healthy cortisol levels generally follow a pattern where it is highest in the morning and gradually tapers off in the evening to get you ready for bed. However if you are stressed physically or mentally, cortisol levels can become elevated in the night which is extremely disruptive to sleep. Ways to support your cortisol levels at night: If you have elevated cortisol levels, you want to bring in support with adaptogens. One of my favorites for sleep is Rhodiola Rosea. 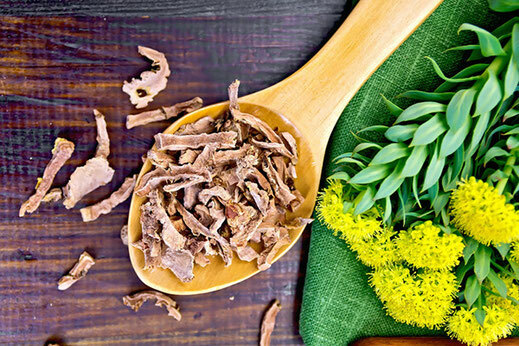 Rhodiola or golden root provides a buffer to mental and physical stress, studies have shown that it restores normal patterns of eating and sleeping and lowers mental and physical fatigue while acting as a protective factor agains oxidative stress. Neurological and mental health conditions including insomnia can be caused by inflammation in the nervous system. This inflammation can originate in the gut and go through the blood brain barrier to the nervous system. Neurotransmitter support can be a very effective way to address and support sleep cycles as well as improve digestion, immune function, and hormone levels. There are about 300 neurotransmitters that scientists know about, and they are categorized as either inhibitory or excitatory. Excitatory neurotransmitters are the neurotransmitters that help you wake up and focus. The inhibitory neurotransmitters calm us down and help us sleep. Due to the complexity of each persons unique system, its important to test and work with a qualified practitioner when addressing your neurotransmitters. GABA is a popular recommendations with sleep, however it is important to know if you have a leaky blood brain barrier first since GABA can cause anxiety if you do. Its also very important to be using cofactors (such as B6 and methyl folate, etc.) with neurotransmitter support, to ensure that your body is able to uptake, use and breakdown the correct chemical messengers properly. that our bodies so desperately need for optimum vitality and health.